You most probably have seen the 3 Rs, Reduce, Reuse and Recycle, in many places, on many billboards or a number of websites you have visited or your teachers may have mentioned them in a lesson about the environment. It is true that by following these simple words, Reduce Reuse and Recycle we will eliminate the waste on our planet and save the environment while at the same time save energy. It would be best for all to get an understanding what the words mean so that when we use them everybody will understand and act the same way. So it is best to know the meaning of the keywords or buzzwords we will be using. Reduce: reduce the amount of things we use so that we will have less to throw away thus less to reuse and less to recycle and for those who do neither to have less to waste. So the best way to reduce is to buy less staff, buy the necessary things only. You should try to buy durable goods and toys, they last longer thus you waste less. Reuse: as the word says, use things again and again. We can reuse a nice empty bottle into a candle holder! Use your imagination to become Green! Recycle: means do not throw in the garbage but use the old or useless things to make new and useful things. For example we can recycle empty soft drink cans to make other cans or recycle a plastic bottle to make other plastic accessories or containers. Waste: Waste is anything that we do not want and we throw away, something which cannot be used by us. Environment: is the place we live in. Not just our house but our town, our country, the rivers, the mountains, the valleys, the forests and the oceans. It is mother earth! Let us see some examples of how the words can be put into actions, real life actions that each and every one can take. Reduce: Did you know that you can reduce more things that you ever thought? You can ask your parents to let you take the bus to school thus reducing the fuel consumption. You can also ask your father to carpool to work thus saving gasoline on one hand and reducing pollution and impact on the environment on the other hand. Reuse: You can reuse plastic bottles by adding water and using them at home or at the field but make sure you recycle when you do not reuse. You can also ask your parents to make sure their tyres are recycled because rubber can be reused to pave roads! 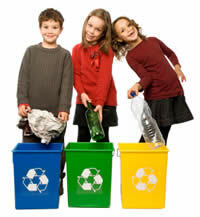 Recycle: Did you know that you can recycle more things than can imagine? You can recycle your old DvDs, electronics, mobiles, computers, ink cartridges and you can even recycle the dirty baby nappies!! Somebody said: I have a 5 gallon bucket which was full of paint that I have used to paint the garage. Can I reuse or should I recycle? What do you think? You can use the bucket to store other smaller paint buckets or painting material and equipment like brushes and scrappers. You can use it to carry water from one location to the other to water plants or trees or as a washing bucket when you undertake the car washing of the neighbourhood. It can be your recycle storage and keep empty cans, plastic bottles, old batteries and anything you can recycle. Do you save energy by recycling? The answer is yes. For example when we recycle glass bottles we save energy. How? From a recycled glass bottle we can reuse the glass and not make from raw material. How much energy is saved? It has been found that from one bottle we can save enough electricity necessary to light a 100-watt light bulb for 4 hours!! In your every action and in your daily life you should always have in mind the 3Rs, Reduce, Reuse and Recycle. If you do this and then you will improve not only your life but the life of those around you thus enabling Green living.